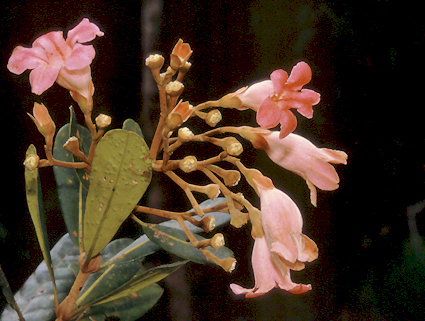 Shrubs or medium-sized trees to tall canopy trees; raphides absent; axillary thorns absent. Stipules intrapetiolar, narrowly triangular or deltoid, persistent. Leaves whorled, 3 to 6 per node, long-petiolate; blades elliptic, obovate or oblong, chartaceous or thinly coriaceous; foliar pellucid glands absent; domatia absent. Inflorescence terminal, not frondose; cymose, pauciflorous to multiflorous. Flowers bisexual, protandrous. 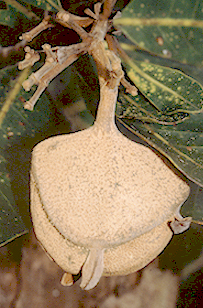 Calyx cup-shaped, with foliose lobes, caducous; lobes 4, deltoid, small or lanceolate. Calycophylls absent. Corolla broadly infundibuliform, zygomorphic, gibbose at base, pink or red; tube externally pubescent, internally glabrous or puberulent, with or without a pubescent ring at orifice inside; orifice annular thickening absent; lobes 5, imbricate (tube non reduplicate), ovate or oblong, margin entire, truncate, rounded, or acute at apex. Stamens alternate to the corolla lobes, included; anthers elliptic or linear, round at base, acute at apex, dehiscing by longitudinal slits, dorsifixed near the middle; filaments attached at the middle of the corolla tube, free at base, slender, long, shorter than corolla tube, unequal, glabrous. Pollen colporate, apertures 4 to 6, exine surface reticulate, released as monads. Style included, filiform throughout, glabrous; lobes 2, ovate. Ovary inferior, 2-locular, ovoid; placentation axile, placenta peltate on the basal portion of the septum, ovules 4 per locule. Fruit a loculicidal capsule, dehiscing basipetally, thickly woody. Seeds horizontal, large, dorsoventrally compressed; wings concentric with entire margin. Geographic distribution: Magdalena-Llanos area, western Amazon Basin, Guayana Shield and central Amazon basin. References: G. K. Rogers, Gleasonia, Henriquezia, and Platicarpum (Rubiaceae). Flora Neotr. Monogr. 39: 1–134. 1984.